Making it simple for Publishers to connect with Advertisers to provide real-time, independently verified advertising metrics and self-serve functionality. View and manage available and sold inventory to Advertisers with access to time based visualisation of available ad space to sell. Ingesting campaign data in real-time with full visibility of your campaign results, including SOV and Budget delivered in live reporting. 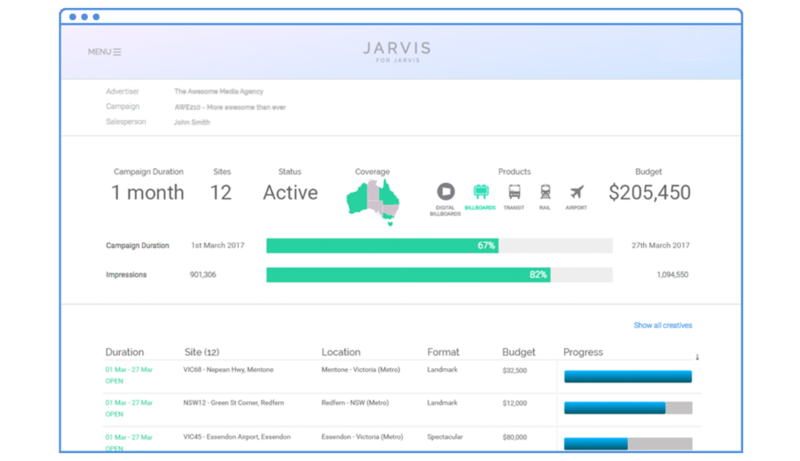 JARVIS ingests Out-of-Home campaign data in real-time enabling Advertisers to book placements and self-buy outdoor advertising with the Publisher. Visualise and analyse the location of paid inventory across the network, with the ability to view Creative, Site Name, Campaign Name, Share of Voice and Budget. Map out the location of a campaign's placement, with JARVIS' bespoke mapping interface. Understand an Advertiser's strategy to assist in conversation with extending campaign placements.